ID: Long, narrow body. Pprimarily brown to orange-brown with medium sized irregular shaped white patches partially outlined with dark spots. No extruding sharp spines on dorsal. 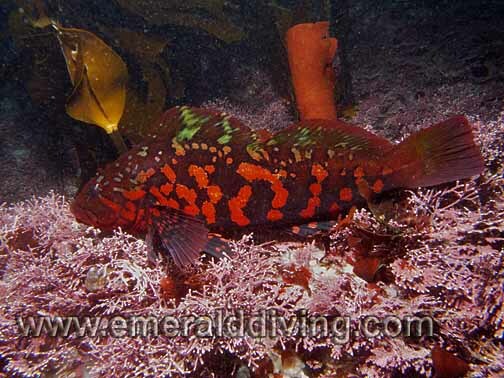 Comments: The kelp greenling is one of the most commonly noted fish when diving the Northwest. This benthic species often shys away when it realizes it is the focus of an approaching diver�s attention. ID: Long, narrow body. Large mouth with some needle-like teeth. Color and mottling varies to best match the surrounding substrate and includes dark browns to deep reds to grays. No sharp spines on dorsal. 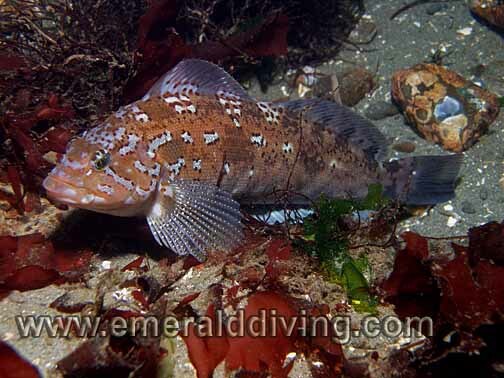 Comments: I have only noted juvenile lingcod in the shallows at Sekiu, which is where this photo was taken. A number of juveniles were present on this night dive - they were hunting Pacific sand lances. ID: Long, narrow tan colored body with broad dark brown to reddish bars. Pointy head with small mouth. 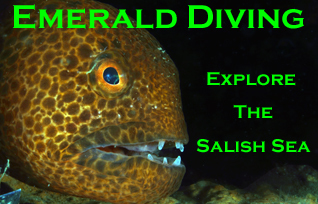 Comments: I often note the benthic and skittish painted greenling anywhere I dive in Washington. 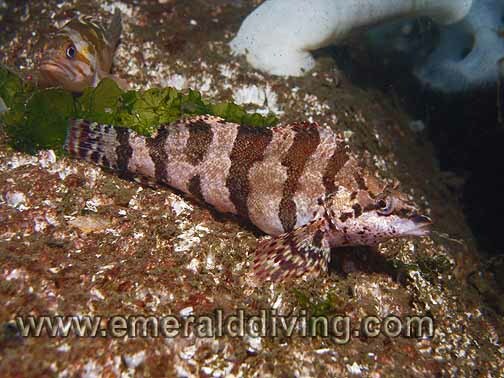 The painted greenling often keeps its distance from an approaching diver. Males turn darker (almost black) during mating season. ID: Similar shape to the kelp greenling. Dark reddish-brown with distinctive horizontal rows of large red, orange, yellow and/or green patches. Inside of the mouth is blue. 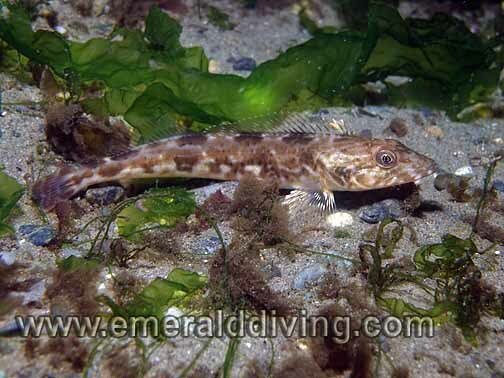 Comments: The rock greenling is rarely encountered by divers as it prefers shallow waters subjected to heavy surge - not exactly prime diving conditions. This greenling can be very territorial and agressive - one repeatedly nipped my fingers as it tried to run me off. ID: Similar shape as its larger rock and kelp greenling cousins. Gold-brown body with numerous white spots and darker patches. Comments: I only occasionally note the white sapotted greenling. When I am fortunate enough to encounter this species, it is usually on a soft substrate near a reef with plenty of broadleaf kelp. The reef at KVI Tower and Three Tree Point are where I most often note this species. ID: Long, narrow body. Females are orange-white with small dark orange dots. No extruding sharp spines on dorsal. Comments: Although this photo taken at Tatoosh Island in the Cape Flattery area, the female kelp greenling can be found at almost all sites through Washington waters. 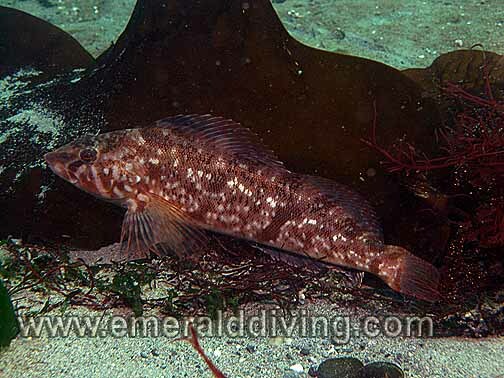 A benthic species, the kelp greenling's diet include small crabs, shrimp, and fish. 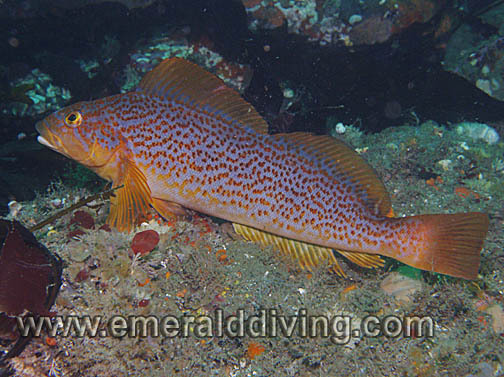 Comments: Lingcod are the finned rulers of Northwest reefs. These large and aggressvie fish are commonly noted throughout Washington waters. 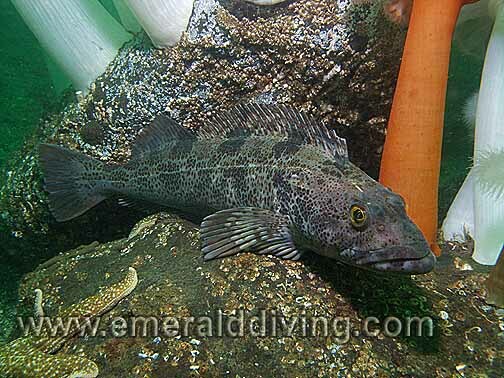 Lingcod often seek a resting place with a vantage point so they can survey their territory.